Her margin of victory at the SBS Open was three shots. Michelle Wie finished a clear 2nd. This was Angela’s third win in her last seven LPGA starts. An argument can be made for her as the hottest golfer performance wise on tour at the moment. Michelle had a 3-shot lead with eight holes to go. She was in part done in by a bad tee shot on 11 that led to a double bogey. Some of Wie’s detractors will say she choked yesterday, I don’t think she did. Here’s why. Angela Stanford played the last eight holes three under par in tough conditions, Wie played them in three over. Like many other players in the field, she struggled. 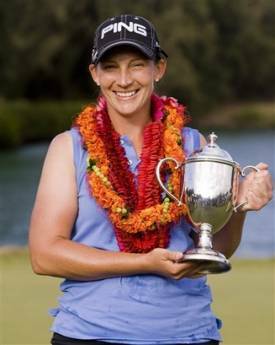 I’m sticking to my prediction- That Wie will be in the LPGA winner’s circle by year end. I may have underranked Stanford too. We have 9 more months of golf to find out if I am right.